"Made with the créme de la créme of vanillas. Hawaiian vanilla steals the show in this delicious rootbeer. Earthy notes plus caramel undertones and nice round bubbles." Our newest soda! Made with real passion. A naturally flavored taste of Hawaii's passion fruit (lilikoi) made in Hawaii. 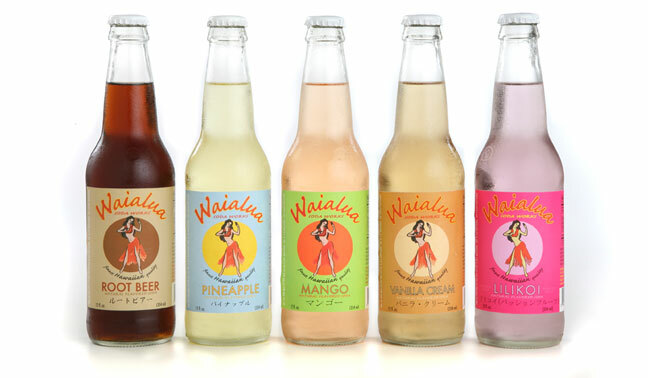 "Summer wheat coloring with petite bubbles and intense honey; Maui white cane and vanilla dominate the palate and create a superb cream soda; clean finish." "Delicate orange blossom and bold mango pair nicely for a truly tropical experience"
Five great tropical flavors you can sample, savor and satisfy even the most choosy tastes. Can't make up your mind? Why not try one of each? "Summer sunshine in a bottle. Wildly sweet pineapple essence captures the origin of this original soda"